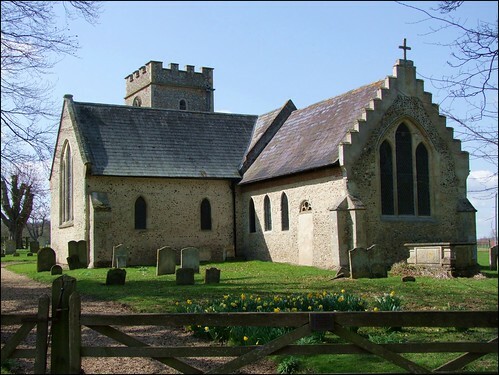 Two of the more remote churches in Suffolk are actually less than a mile apart, just to the east of Stowlangtoft. One serves the parish of Langham, and the other is this one, St Michael at Hunston. I remembered that, the first time I'd come here, it had taken me some time to find it; it was hiding in a gloomy dip behind a farm, and the only way I could find to approach it was a muddy track between the farm and a field. And when I got there, it was locked with no keyholder listed. However, that was ten years ago, and today this church is welcoming to visitors, listing two nearby keys. Even if you didn't go inside, you would find much that is interesting to be seen from the outside. For a start, this is basically a small Norman church, but it has a massive south transept. The effect is something like two separate churches which have got stuck together at right angles. The lancets and three-leaded light of the transept window look exciting, but they are all renewals, from the 19th century restoration. However, the top of a medieval priests door in the south chancel wall was also revealed at some point, and infilled with a Decorated window. On the occasion of my first visit, I was not fully prepared for the scene which greeted me as I stepped inside. All the furnishings were swathed in plastic sheeting, because St Michael has a serious bat problem. I have previously gone on at tedious length about the problems which bats cause to churches, and so I will refrain from doing so here; suffice to say, until churches are allowed by law to dissuade bats by providing alternative accomodation, situations like that at Hunston will persist. However, on a return visit I found everything beautifully cleaned and cared for. The overwhelming presence inside the church (apart from the bats, of course) is of the Heigham family, who lived for generations at Hunston Hall. At their most imposing, they are here in the persons of Captain George Thomas Heigham of the Royal Irish Dragoon Guards and his son Major George Henry John Heigham of the Royal Welsh Fusiliers. Their Coade stone memorial, surmounted by sabres and regimental badges, notes that Heigham fils was killed at Lucknow, during the attempt by the British to impose authoritarian rule in the years immediately following the Indian Mutiny, and is buried in the graveyard there. His father went to a gentler sleep at Sproughton on the outskirts of Ipswich. Most of the Heighams cluster up in the sanctuary, and here also is some of the excellent early 20th century glass in the church, the best of which is Heaton, Butler & Bayne's Blessed Virgin and Child. Beside it is their very good war memorial window depicting the angel of Victory, and captioned To the Glory of God and in Memory of the Hunston Men who fell in the War 1914-18 from the Heigham Family - a pleasing example of what was once a typical rural patronage. There are plenty of medieval survivals, a couple of them rather unusual. The oldest is the head of a Saxon cross, found in the graveyard, and one of only about half a dozen in East Anglia. The most spectacular is the large, flat image niche in the transept with its extraordinary floriated border. If you look closely, the petals and leaves are not identical, but each is slightly different. Not far off is a most unusual corner piscina, set into the corner as if in reverse of the usual form. The font is also 13th Century, and there is no reason to think it did not come from this church originally. It is a plain drum, the simplicity of which suits this quiet place, and it has been reset on a Victorian collonade. The bench ends in the chancel are probably 19th Century, though. What appears to be a battered stone memorial on the south side of the nave is actually a charity board. It seems to have been reset in a window splay. There is a charmingly rendered transcription of it on a board opposite, and it remembers the will of Mrs Mary Page, who died in 1731. Her passion was education, and she left money to provide for a Mistress to teach three poor girls to read, knit, spin and sew and also for proper books to be purchased for the children not only whilst in school but chiefly to be given them when at the end of 3 years they shall leave the school. I was delighted to discover that, as the gift was in the form of land, it has kept pace with inflation, and the terms of this noble bequest are still adhered to, albeit in a slightly different form. The Mary Page Charity still provides funds for school books and uniforms for the children of the Parish. No doubt successive PCCs have taken note of Mrs Page's final injunction: As ye Parishioners of Hunston hope for the Blessing of Almighty God to attend them and their succeeding generations, let them not dare to pervert ye Revenues of Lands thus bequeathed to any other purposes whatsoever.